So, with that in mind, this article aims to help you understand how to build a simple responsive mega menu with Foundation. We’ll go step by step and construct a fully functional version of it. And take note that Foundation doesn’t support mega menus, but we’ll do our best to implement an easy-to-use solution based on its predefined styles. For more advanced and effective customizations, be sure to check/modify the corresponding Sass files. If you’d like to jump ahead, the final demo is located here. As you can see, nothing fancy happening here. We just construct the menu by taking advantage of the basic code for the topbar component that Foundation provides us. In the upcoming sections, we’ll create a mega menu for two different items in the main menu: the “Programs” menu item and the “Studies” item. In fact, we’ll build two variations of this menu. Notice that we wrap the menu within a div element, with a class of contain-to-grid. In this way, our menu will have a maximum width equal to the grid width, which is 62.5rem (1000px) by default. If we don’t enclose the menu inside this container, its width will be set to the viewport width. With that, we’ve successfully positioned our menu and we can move on to the next step! Notice that this menu consists of two rows, each containing three equal-sized columns (using the .medium-4 class). In this instance we have one row and two equal-width columns inside that row (using the .medium-6 class). Note the structure of the elements with the .info-wrap and is-hover classes. We’ll refer to those elements in the next section. In this example, we’re going to swap in and out some of the content inside the menu, when the user hovers their mouse over a particular section’s link. This might not be the most user-friendly way to do it, but it demonstrates what can be done within the mega menu, when it’s displayed. All the links are wrapped inside an element with a class of .info-wrap. In the CSS, we hide all the items by default except the first one, then we can swap in the correct corresponding item by adding and removing the .info-visible class on the different .info elements. The code above is triggered when the user opens the “Studies” mega menu, then hovers the mouse of one of the “Programs” links. The value of the idx variable is adjusted by “2” to account for the extra initially visible .info element and the fact that indexing in jQuery’s CSS selectors is not zero-based. We also make sure that the default info box is the only one displayed when the user moves the mouse off the mega menu. 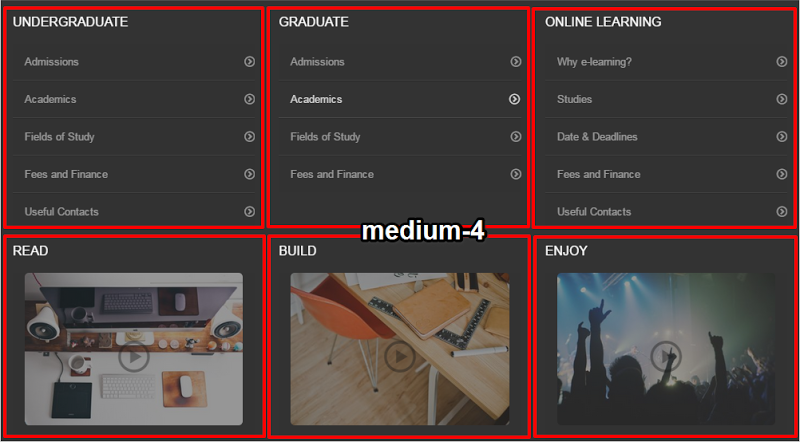 See the Pen Mega Menu Dropdowns with Foundation 5 by SitePoint (@SitePoint) on CodePen. Mega Menus… Good or Bad? Alright, we’ve built our simple mega menu, but you might be wondering whether it is a good approach to use a mega menu or not. Well, as is often the case, there’s no straightforward answer. Mega menus can be a controversial topic in the web design and UX community. Some people find them useful and practical (e.g. saying they are easy to use), while others avoid implementing them (e.g. poor SEO). For sure, however, before you decide to structure your navigation based on this or a similar technique, you’ll have to take into consideration the pros and cons of this solution for your project. In this article, I described a process for building a responsive mega menu with Foundation. Of course, this is my approach; you may have a different one. In any case, I hope that you found this solution interesting and you might give it a try in one of your upcoming projects. Also, feel free to share with us your own approach as well as your opinion about the use of mega menus. Thanks Daniel! I agree, Foundation is a very interesting and powerful framework. I saw your mega menu, it's nice! Also, I like your theme!! Hey, great article. I was wondering about your perspective on page load times. I've just implemented a mega menu as part of an update to the eCommerce site for the company I work for and it seems to be working brilliantly in addition to some of the design changes we've implemented. I am concerned about loading all of this content up front and the possible effects of SEO regarding internal linking and am considering loading the content via AJAX. I'm having a difficult time finding any information on whether or not this is a good idea and was hoping you could lend your perspective or might have a good article to point to. Thanks. Thanks for your message! I agree that AJAX is a good option, especially if your menu contains a lot of media such as images or videos.